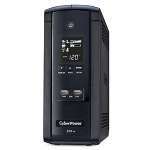 This UPS system CyberPower is ideal to use for your mid to high-end computer systems or networking setups. 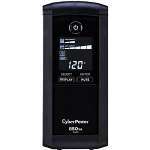 It features a dynamic line conditioning for awesome defense against unexpected surges/spikes and provides battery backup when brownouts or blackouts transpire. 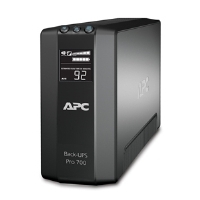 With this UPS' GreenPower UPS� advanced circuitry, UPS energy costs are reduced by up to 75%. 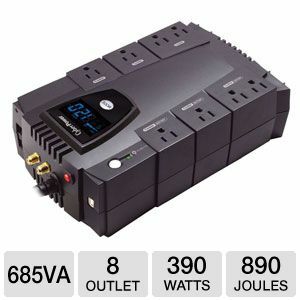 It also has a capacity of 685VA / 390Watts, and has eight NEMA 5-15R receptacles and four fail-safe outlets for critical loads. Using the intelligent multi-function LCD panel, you can view and record the UPS vitals in real-time. In addition, it is packed with one maintenance-free, user-replaceable 12V/8Ah battery, along with EMI/RFI filters to guarantee resistance against disturbances and surges. 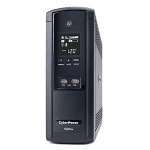 And with the PowerPanel� Personal Edition UPS Management software, this UPS automatically closes critical computer files and properly shut down the system when an outage takes place. 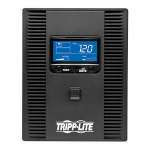 Order this remarkable Intelligent LCD Series UPS today. 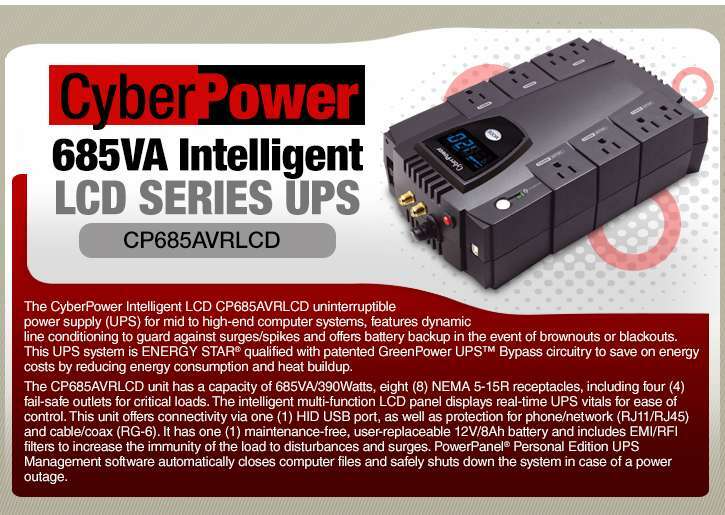 The innovative front panel displays 11 different UPS vitals: input voltage level, output voltage level, automatic voltage regulator, battery capacity, runtime estimate, load level, output frequency, on battery, overload, fault condition, and silent mode. 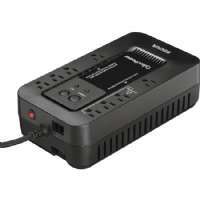 AVR technology stabilizes the AC voltage and maintains a safe voltage level without switching to battery-mode. This conserves battery life, and delivers cleaner AC power to connected equipment. 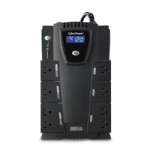 Patented GreenPower UPS� advanced circuitry reduces UPS energy costs by up to 75% compared to competitive models. 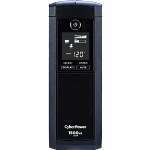 Advanced cooling design, high-end system components, and GreenPower UPS� technology give CyberPower UPS systems the lowest sound emissions in their class. HID compliant USB port enables full integration with built-in power management and auto shutdown features of Windows, Linux and Mac OS X. 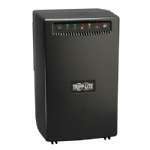 Distinctive tones identify when the unit is running on battery power, if it is overloaded or when the battery is low. The user may use this convenient unit reset switch in case of an overload. In event of a power outage, PowerPanel� saves open files and "hibernates" your PC to increase the run-time of the UPS unit. PowerPanel� is quickly and easily installed on any Windows-based PC and is designed to utilize minimal system resources. Diagnostic screens give immediate indicators of the status of your UPS and also include the following features: Silent operation mode, configurable system notifications, automatic self tests, adjustable high/low voltage warnings, event/data logging, and scheduled shutdowns.